Saksoft has been empowering Fortune50 companies by providing right consultants. With a candidate database of over 300,000 we are able to help our customers with right talent at right time. Saksoft has earned its name as the ‘most dependable recruitment partner’ in the industry because of its rigorous candidate pre-evaluation process. Based on the customer requirement, Potential candidates are screened on technology competencies, industry knowledge and familiarity with business process and workflows to make sure they fully comply with the requirements. We also evaluate their Cultural & Personality fit for an organisation apart from their technology competencies. Usually, one out of three candidates is hired by our customers and most of these candidates transition to full-time employees. Since our pool of applicants is wide and deep we typically respond with recommendations within two days. 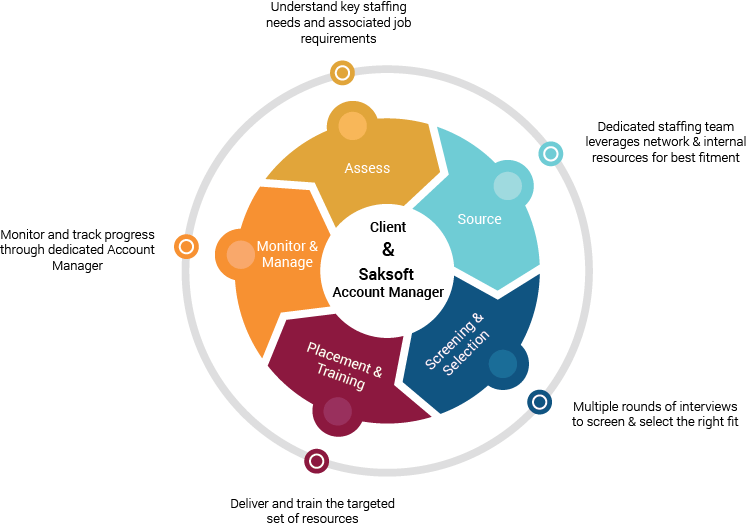 Saksoft’s Customer centric approach of placing a dedicated account manager and recruitment teams for each customer ensures a high service quality. Our Consultants are engaged across key customers such as Bank of New York Mellon, Coca-Cola, AT&T, Bank of America, JP Morgan Chase, Morgan Stanley, NY Life and Fidelity. If you want to devise your IT roadmap or build a new application but lack the right staff, Saksoft can help you in finding the right talent. We will staff your entire project team, starting from scrum masters, project manager, IT engineers to testers. Our consultants will work either from your offices (On Premise) or from a location close to you (Near Shore). While the control of the project always remains with you, Saksoft will ensure a smooth delivery by providing the support functions for its consultants, like HR services. Saksoft contract staffing solutions are a perfect fit for companies that experience frequent fluctuations in resource requirements. Our team can help you hire contract staff at the start of the project when extra resources are required. We will also handle the termination of contracts as the project ends. Under these services, Saksoft handles the entire contract, payroll, employee insurance and federal reporting. A Right to hire approach provides the customers with an opportunity to evaluate the Saksoft consultant for a pre-defined period before converting them to a regular employee. Saksoft handles all the HR functions of its consultant during this contract period. At the end of the contract, the consultant can be hired by the customer as a permanent employee. Saksoft permanent placement solutions help our customers to hire the right candidates within the shortest possible time and within budget. If you lack the expertise or the experience to hire staff we will act as your team to attract the ideal candidates for you.